Even with the short week we still managed to get a lot done. The plumber is almost done now and I had the hvac guy come through and he roughed in the whole house in 2 days. 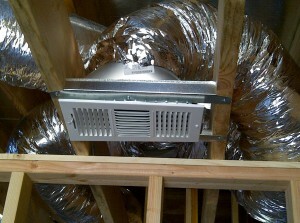 I installed a Goodman 70,000 btu central heat system only with all new ducts. It was a breath of fresh “air” not to have to do the full central air system because in most areas in San Diego you don’t even need air conditioning. These guys don’t mess around in this town, he rolled in with 6 helpers and they knocked it out. What a change from “Land of Manana” as we called San Antonio, where most workers only did the bare minimum, never showed up and just squeaked by since the cost of living is so low there. Thanks to my buddy Curtis Gabhart from Gabhart Investments for the referral! Check out his site if you want to see how the big boys are rehabbing here in San Diego. I always bring the hvac sub contractor through second, then finally my electrician will come Monday and start with my 200 amp rewire and new service. The best news all week was that I finally appear to have approval from the Historical Review Board. The City Planner emailed me late Friday and said I could come pick up my plans. My project has been under review for over 4 weeks now, luckily they stamped my structural and mechanical plans right away so I could get started. If everything was approved then I officially have the permit and I’m free to start calling for inspections and can move forward faster. I’ll call for the foundation inspection first so he can check our forms and rebar, then we can pour Wednesday. 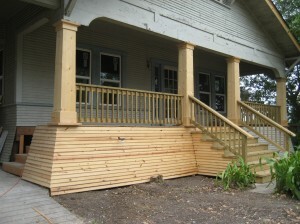 Next I’ll call in for framing inspection so I can then put the roof on. 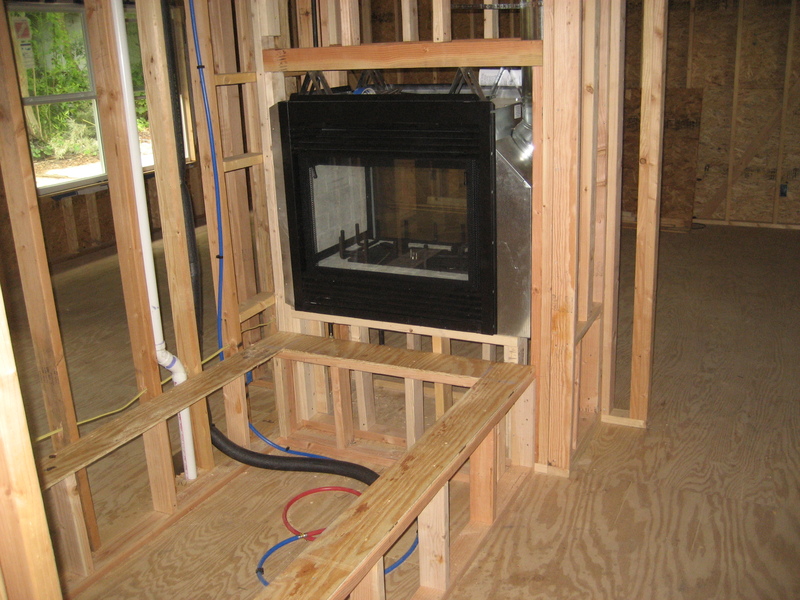 Finally I’ll call for rough-in inspections on all 3 trades so I can then hang insulation and drywall the house up. It seems like a lot but I’m really not that far away from getting it sealed up. I was a little surprised about code differences between here and in Texas, seems with all the regulations here in California they would be a little more strict on the duct work but evidently you don’t even have to put “pookie” on the registers or plenum. 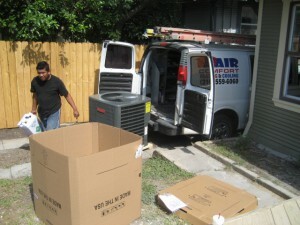 In Texas with the summer heat they were really strict on the system install but then again this is heat only and no a/c. Right now it’s 68 degrees and sunny. Sorry, to my friends in San Antonio already sweating in 100 degree, 80% humidity.. its going to be a long summer! 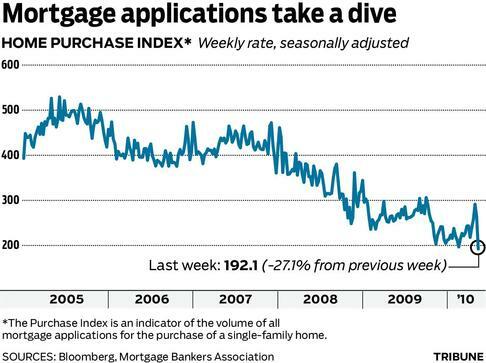 The San Diego Real Estate market saw some price slippage, in May there was a 4% decrease from year-over-year prices. Nationally, the 20-City Case Shiller Metro home prices are already in double-dip territory but we aren’t there yet even with the large decrease. I attribute most of this to the artificial market and tax credit last Spring, if the government would just stay out of everything and let the markets correct naturally I think we’d be in a better place. Here’s a good article by Rich Toscano over at Voice of San Diego.org. New regulations from the City of San Antonio with regards to my mechanical permit tripped me up this week. Turns out there are several new codes that took effect January 1, 2010 which affect new central air conditioning systems in remodels. 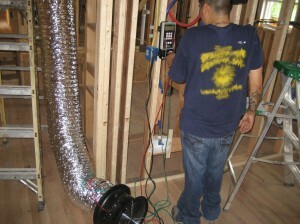 San Antonio is now requiring a duct blast test to be performed by a third party licensed mechanical contractor. 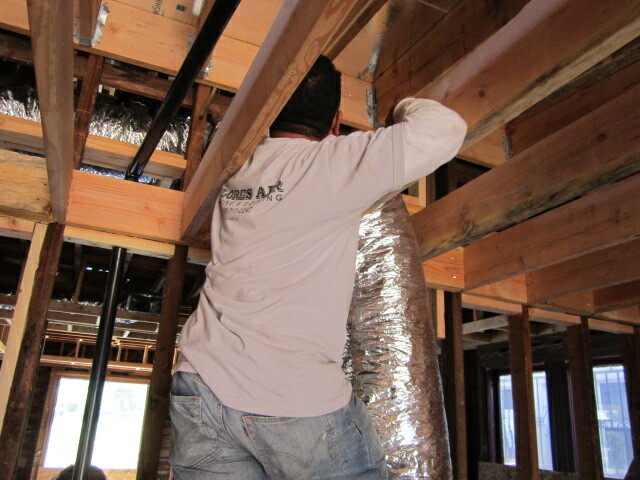 After having my new system installed and inspected for rough-in we had to bring in another contractor to test the duct-work for leaks. Since you would never know if there were any leaks until the system was turned on at the time of final inspection they have come up with this cool way to test your contractors work before you hang the drywall. A fan is connected to the return air box and all registers are sealed with tape. They then crank up the fan and measure at one of the grills for pressure. 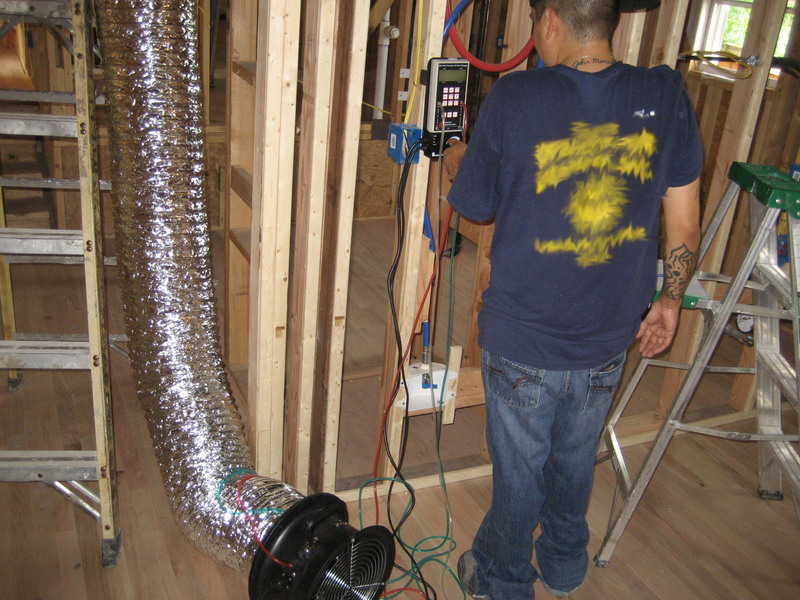 The fan measurement vs. its affect on the duct pressure determines efficiency. 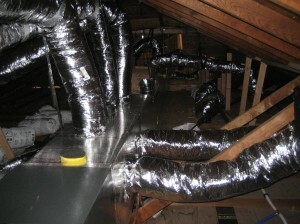 Any leakage is shown on the computer and would indicate a loose seal somewhere that may need more tape or “pookie.” Before this technology existed we would wait until passing final inspection, turn the a/c on and manually feel around the joints for cool air. 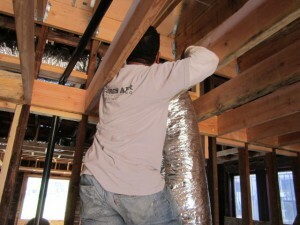 Leaks in your ducts cost big bucks on utility bills, especially in hot climates like Texas. If you are remodeling a house its now mandatory to have this test performed, the results are sent to the local power company CPS, and you wont get your electricity turned on without it. If you haven’t checked your system lately it might be worth a trip to the attic, one neighbor to a rehab I did asked for my help last summer. Upon inspecting her system my A/C guy saw that she was losing all the cool air into her attic as the tape from the coil/furnace had come completely unglued. Today we passed the duct blast test as well as rough-in for mechanicals.